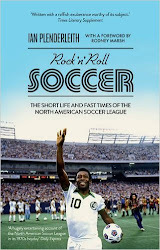 ROCK N ROLL SOCCER: The Short Life and Fast Times of the North American Soccer League, by Ian Plenderleith. This is the blog to back the book hailed as "fantastic" by Danny Kelly on Talksport Radio, and described as a "vividly entertaining history of the league" in the Independent on Sunday. In the US, Booklist described it as "a gift to US soccer fans". The UK paperback edition published by Icon Books is now available here for just £8.99, while the North America edition published by St. Martin's Press/Thomas Dunne Books can be found here for $11.98. Thank you. 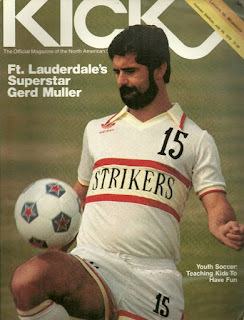 Today's edition of the German bi-weekly Kicker tells the bitter story of how West Germany's World Cup-winning striker Gerd Müller was forced out of Bayern Munich in the late 1970s and went to finish his career at the NASL's Fort Lauderdale Strikers. The article begins by talking about how players who have recently left the club, such as Bastian Schweinsteiger and Mario Mandzukic, were fully praised by coach Pep Guardiola even as they were being eased out of the door. Müller was no less of a club legend than Schweinsteiger, yet the man who scored 398 league goals for the club in only 453 games was, in his own words, "systematically destroyed" by his Bavarian bosses. His former team-mate Frank Roth confirms that "Gerd was properly squeezed out. That's not how you do things, it was not fair. It was not a pleasant departure." At the time, the team's commercial director Walter Fembeck said, "He [Müller] has to understand that he's no longer the best." Club President Wilhelm Neudecker was no more tactful: "We need Gerd as a striker, not as a monument." "Only achievement counts - and Gerd Müller has not achieved anything for some games now. He's lacking in fitness and mobility. If his former coaches turned a blind eye, that was up to them. That's not how I operate." On February 14, Müller sent the club his resignation letter by taxi and left for the Strikers "without flowers and without warm words for the man to whom Bayern owed so much", as Kicker puts it. After his career finished, Müller turned to the bottle, and only when his alcoholism became public in the early 1990s did Bayern remember its former star. Franz Beckenbauer and Uli Hoeness intervened to help him give up booze and found him a job at the club. The move to America was almost certainly the right one for Müller, even if the manner of his departure from Germany still beggars belief. He and Peruvian forward Teofilo Cubillas formed a prolific partnership up front for Fort Lauderdale in 1979, and took the team into the playoffs. "Neither spoke each other’s language," said David Chadwick, who was an assistant coach at the Florida team, in an interview for Rock N Roll Soccer in 2013. "I couldn’t speak either language, but I noticed in training with players like that, they all understand - they want to be challenged, they want to work, they do have an appetite for the game, that’s what made them great players. It was their eyes that made such a difference, you could just sense they knew exactly what was going on." Chadwick said that he "learnt as a coach so much from being around Gerd Müller and seeing how he turned players in the box. When I grew up you did the Matthews, you dropped the shoulder and exploded past someone. I was good at that, but I learnt so much more from these other players in the NASL." In 1980, Cubillas and Müller were on even better form, and the pair's goals lead the Strikers to the 1980 Soccer Bowl, which they lost 3-0 to the Cosmos. In 1981, Müller's goals finally dried up and he sensed that was the moment to retire. A venture with a steakhouse didn't work out, but following his rehabilitation he later became the long term assistant coach of Bayern's reserve team. Ron Newman: 1936-2018. "When the NASL folded I was sitting in my office crying my eyes out"
copyright Ian Plenderleith, 2014. Simple theme. Powered by Blogger.